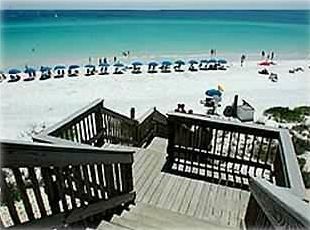 Amalfi Coast Resort in Destin area voted one of the most popular family and friends beach destination. Small resort with only 108 units on over 8.6 acrea of lush landscaping. Our calendar is ALWAYS up-to-date to make year-round planning easy and fun. Beautiful 1,400+ sq. ft. condo sleeps 8 people comfortably. It is perfect for a family or to share with friends. This spacious and modern condo has unobstructed Gulf views from Master Bedroom, Living/Dining Room, Kitchen and large Balcony. FREE WIFI and Hi-Speed Internet. Parking garage with premium designated parking space close to elevator. Locally owned and managed by owner. We want you to feel our home is your home. You will be pleasantly surprised with all the extra ammenities that are not normally in rental units. Our spacious 2nd floor unit sleeps 8 comfortably with plenty of privacy. The King Master Suite has it's own private full bath. The second King Suite has a full bath steps away. The small Bunk Room is perfect for the kids with a TV. Unobstructed Gulf views from Master Bedroom, Living/Dining Room, Kitchen and large end-unit balcony. Sunsets, breezes and waves free. The main living area has a Queen Sofa Sleeper Couch, Love Seat, Chair and TV/DVD/Stereo. The dining area seats 8. Plenty of lighting and blackout drapes. Kitchen is well equipped with everthing imaginable for your favorite recipes including spices. Amalfi Coast Resort is situated on 8.6 beautifully landscaped acres with only 108 units, underground parking and 362 feet of private beach on the Gulf of Mexico. Two pools with one heated winter, lighted tennis courts, BBQs, pond and bridge leading to dune walkover with plenty of green area for the kids to play. One mile West of Silver Sands Outlet Mall on Old Highway 98 (Scenic Gulf Dr). Close to shopping, golf, local attractions and resturants. A delightful vacation destination for the whole family offering every aminity - very luxurious accommodation's! Call or email owner for reservations. Calendar always up-to-date. We own and manage this unit (A204) as well as one other unit D226 (vrbo property #471289) in the Amalfi Coast Resort . We are a retired military family and live near the Destin area, so we take great pride in our units. Amalfi Coast Resort give you all the benefits of a large resort complex, with the benefits of a small family-friendly atmosphere. Our unit has a fantastic view, wonderful amenities, and dedicated personal attention. The Amalfi Coast Resort is situated on over eight acres of lush landscaping with 108 units, two large pools, tennis and private gated access to our beautiful stretch of beach. Three Airports including one International within 45 mins. to 2 hour drive. An easy drive-to destination. The area water sports, golf, fishing, amusement parks, world class shopping and restaurants offer you any and everything imaginable to do while vacationing. Unobstructed Gulf views from master bedroom, living/dining room, kitchen and large end-unit balcony. Just across the street with with unbelievable views of the Gulf of Mexico and sunsets. Lake and fountain on resort grounds. Large grassy areas for fun and games. Reserved Parking Space close to elevators. A big deal during the busy seasons. Corian counter tops. Upscale dishes, glasses, blender, toaster, crock pot and all kitchen amenities including spices. Access from living and M-Bedroom. This large end-unit balcony offers unobstructed gulf views for surf and sunsets. Amalfi Coast Resort is one of the most popular family resorts on the Gulf and close to shopping, restaurants and local attractions. Beautifully landscaped on 8.6 acres with only 108 units. Resort new in 2002. Private gated beach access. Very nice condo with a great view and in a good location. Covered parking, luggage carts and grocery carts were a great addition. Only thing I would ask for is better bath towels. They were pretty worn out. Other than that, it was a great place to stay! Solid place with a view of the Gulf and of the resort fountain! Across the street from the beach! Property managers were easy to coordinate with and check out procedures were not overbearing. Would stay again! Great accommodations! Close to shopping, restaurants, and beach. Loved having you! So glad you enjoyed it. Really lovely in every way. This property is so spacious and comfortable. It is close to the beach with a great view of the water. Also close to a wonderful pool (2 actually). The beds are comfortable and the sofa bed is ok. The 3rd bedroom with the twin loft beds is very snug and is also the laundry room. So probably not for big kids. We really enjoyed this trip! Check in is 4 PM and check out is 10 AM. Rates subject to change. Ask about our military and first responders discount.